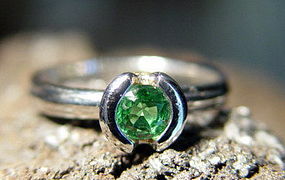 Wide Band (0.5 inch) 18K. 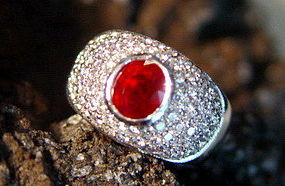 Gold Ring (13.78 grammes) set with one Genuine Ruby @ 0.45 ct. and 26 Brilliant Diamonds @ 0.29 ct. total weight. 18K. 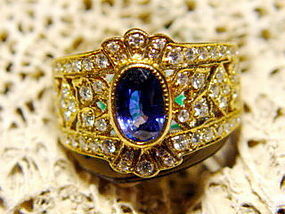 Gold Filigree Ring set with one Genuine Sky Blue Ceylon Sapphire @ 1.05 ct., 53 Brilliant Diamonds @ 0.32 ct. total weight and 17 Brilliant Diamonds @ 0.19 ct. total weight. Solid 18K. 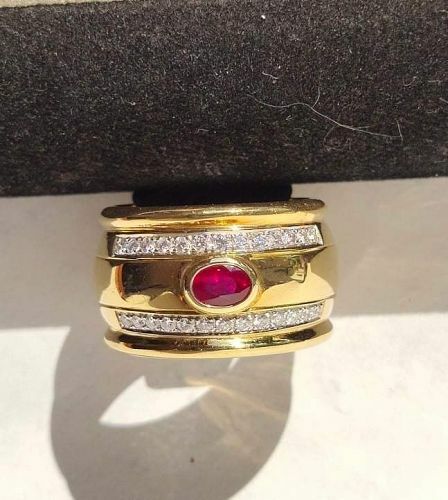 Gold Ring set with one Genuine Ruby @ 1.10 ct., 10 square Diamonds @ 0.23 ct. total weight, 32 Brilliant Diamonds @ 0.27 ct. total weight. 18K. 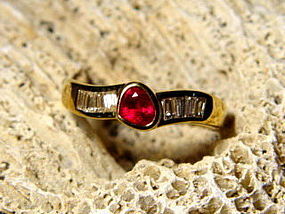 Solid Gold Ring set with top color genuine Ruby @ 0.55 ct., and 8 tapered Diamonds @ 0.24 ct. total weight. 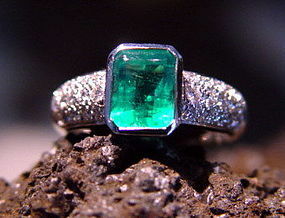 Absolutely dazzling solid 18K. 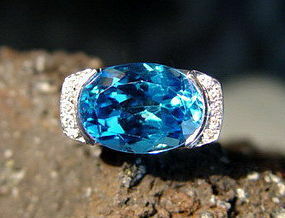 White Gold Ring set with large Genuine Blue Topaz @ 14.37 ct., and 10 Brilliant Diamonds @ 0.17 ct. total weight. 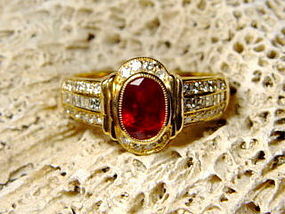 Very fine Solid 18K. 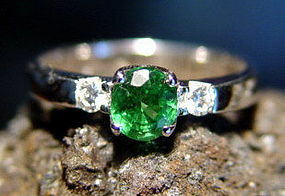 White Gold Ring (4.22 grammes) set with one Genuine African Green Garnet @ 0.59 ct. flanked by 2 Brilliant Diamonds @ 0.12 ct. total weight. Solid 18. 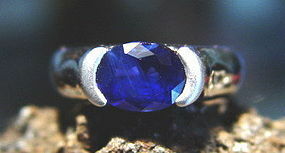 White Gold Ring (7.84 grammes)set with Genuine Deep Blue Ceylon Sapphire @ 2.79 ct. 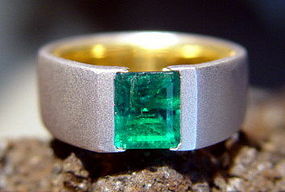 The ring band is shiny white gold whereas the top bezel frame has a mat-brushed finish. Important Solid 18K. 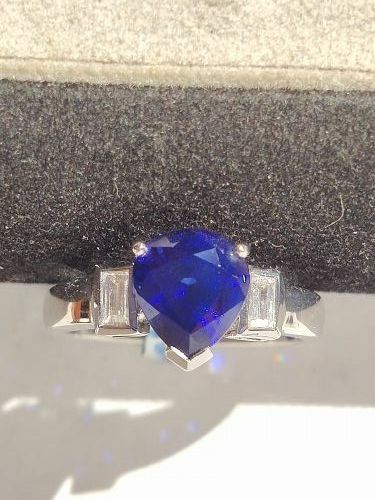 White Gold Ring (5.49 grammes) set with one heart shaped Genuine Ceylon Blue Sapphire @ 3.11 ct. flanked by 2 square Diamonds @ 0.26 ct. total weight. Exquiste Solid 18K. 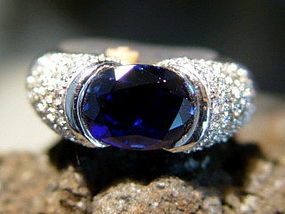 White Gold Ring set with one Genuine Oval Ceylon Blue Sapphire @ 2.00 ct., flanked by 2 Trilliant Diamonds @ 0.84 ct. total weight. Solid 18K. 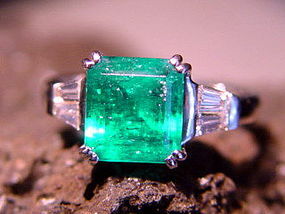 White Gold Ring (5.93 grammes) set with one Genuine Colombian Emerald @ 1.48 ct. and 30 Pave Diamonds @ 0.47 ct. total weight. 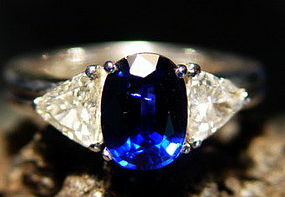 Pear shaped Ceylon Blue Sapphire-Diamond Ring 18K. 18K. 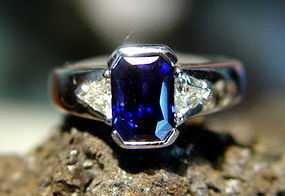 Solid White Gold Ring (5.28 grammes) set with one exquisite Pear shaped Genuine Ceylon Blue Sapphire @ 2.873 ct., flanked by 2 Baguette Diamonds @ 0.18 ct. total weight. Solid 18K. 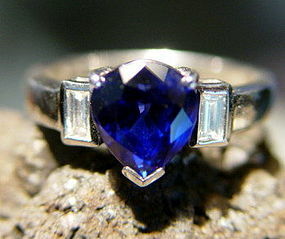 White Gold Ring set with large Genuine Blue Sapphire @ 4.03 ct. and 106 pave Diamonds @ 1.13 ct. total weight. Solid 18K. 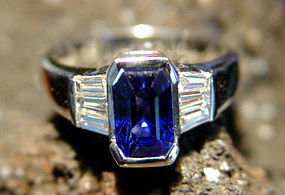 White Gold Ring set with very attractive octagon-emerald cut Genuine Ceylon Blue Sapphire @ 2.46 ct., flanked by 6 tapered Diamonds @ 0.59 ct. total weight.